This was originally a guest post I wrote for SprinklePop’s blog. 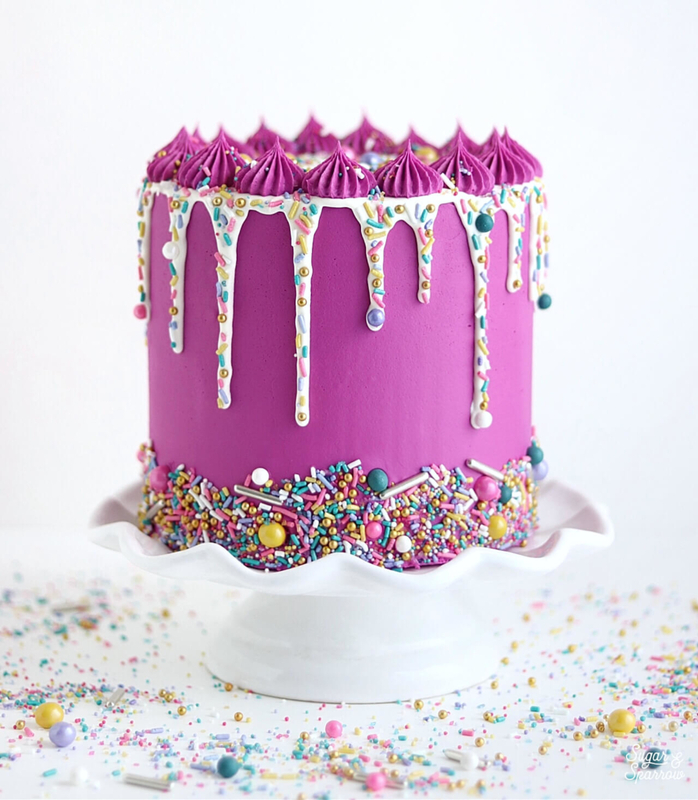 It’s too good not to share here, because sprinkle drip cakes are so much fun to make with any sprinkle mix! 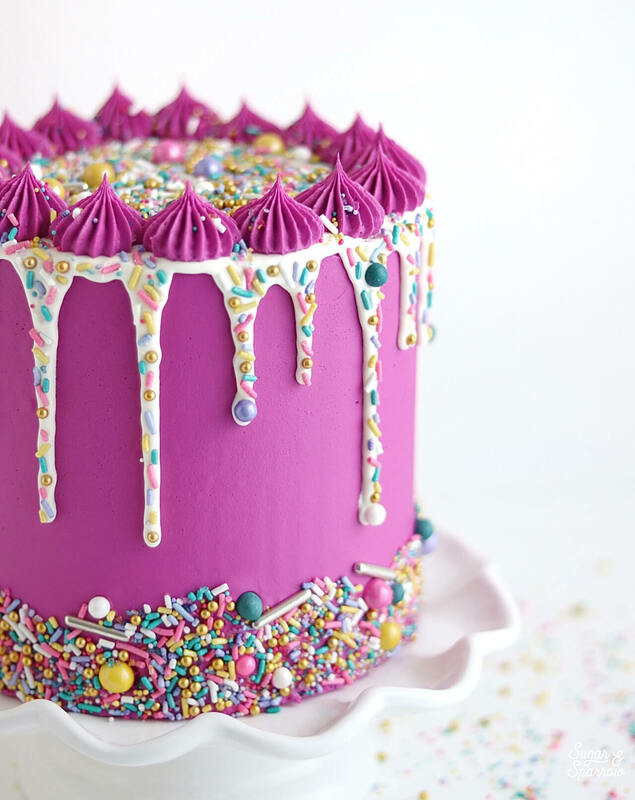 There are drip cakes, and then there are sprinkle drip cakes. 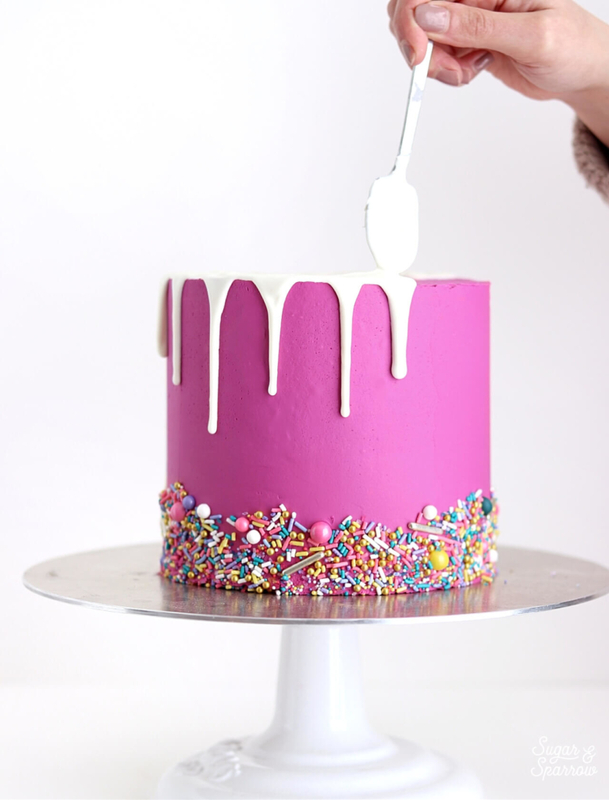 And let me tell you, while both are pretty to look at, the sprinkle version is so much more fun! 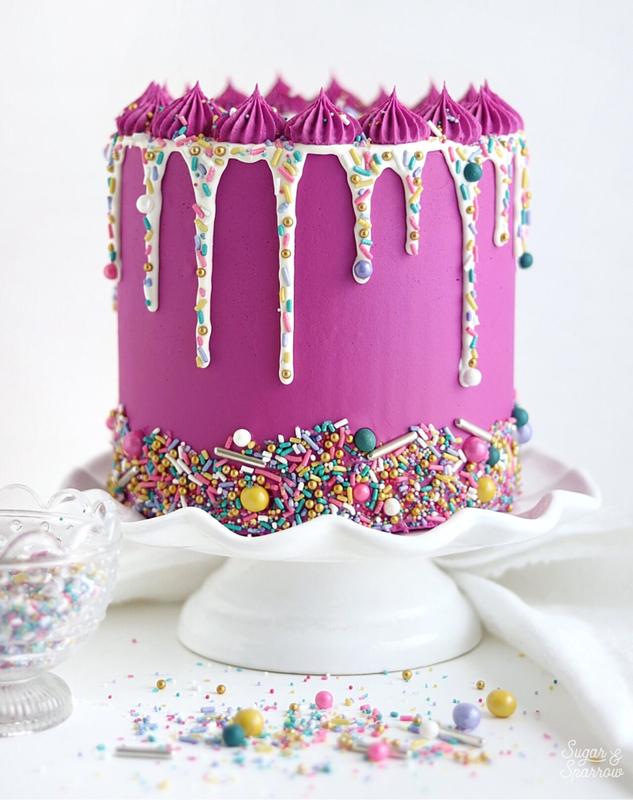 The sprinkle drip cake trend was popularized by one of my favorite cakers to follow on Instagram, @brittanymaycakes. 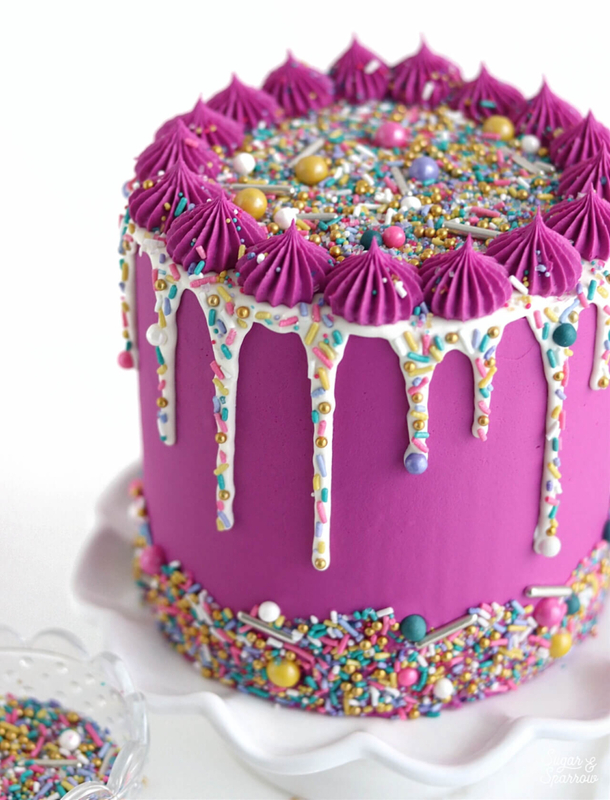 To my knowledge, she’s the little genius behind putting sprinkles on top of a ganache drip, and I just had to give it a go because it looks so stunning – especially with this Bewitched sprinkle mix by SprinklePop. Before you get too crazy dripping your ganache, I always think it’s a great idea to do a test drip on your chilled buttercream cake. Make sure your ganache is room temperature and good drip consistency first, create one drip on the side of your cake, and wait until it stops traveling. If your ganache is too runny or warm, it will travel all the way to the bottom of the cake quickly. If it’s too cold and thick, it won’t travel much at all. Adjust the consistency and temperature of your ganache if need be, and only continue the process of dripping your cake once you’re satisfied with the look of the drips. Once your ganache has passed the first drip test, continue dripping your ganache down the sides using either a squeeze bottle or the spoon method. It’s best to start by dripping every side before moving on to the top of the cake. This way you can better control the look of the drips from the side view and only fill what’s necessary on the top. When all the sides have been dripped, pour a small amount of ganache on the top of the cake and smooth it with an icing spatula or the back of your spoon. Be sure to only fill in the space that’s not yet covered with ganache, because adding too much might make your drips travel farther than you’d like. I always spread the ganache on top until it just reaches where the drips have started to cover on the top of the cake. Let the ganache rest in the refrigerator for about five minutes while you pour the sprinkles into a small bowl. After refrigerating for just those few minutes, the ganache drips should be sticky, but set enough to ensure that adding sprinkles won’t drag them down. 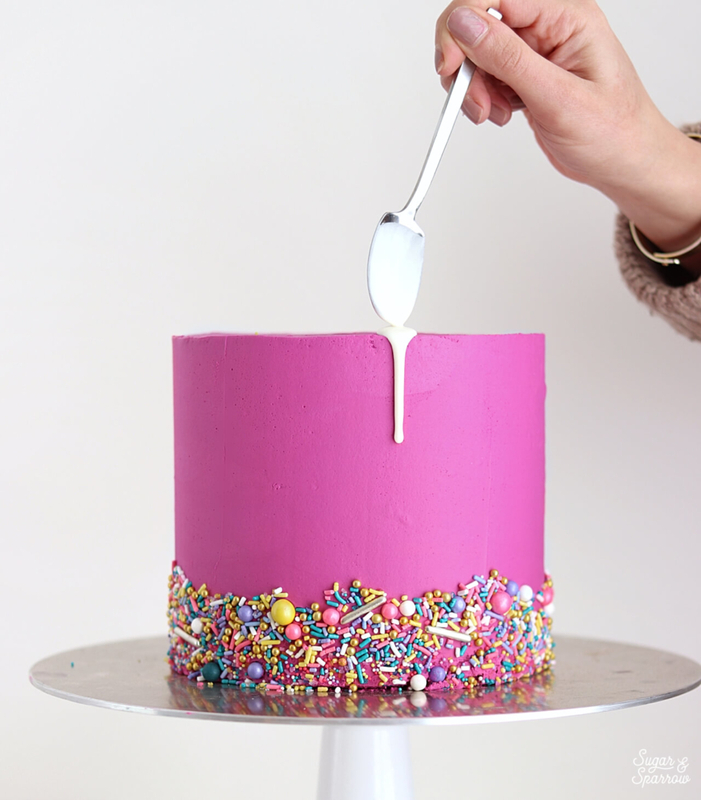 Using your tweezers, place the sprinkles onto the ganache one by one until you achieve the look you’re going for. This could take anywhere from 20-30 minutes, depending on how precise you want to be, but trust me. It’s so worth it! 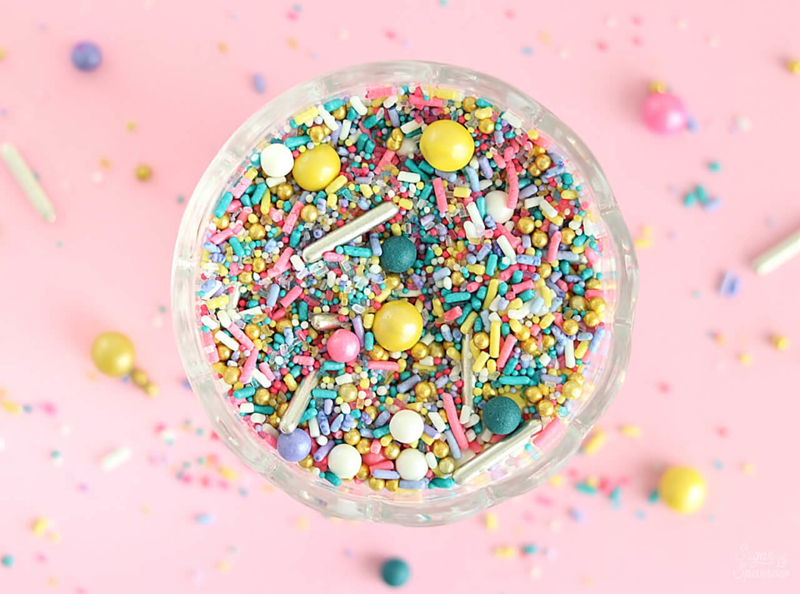 While you can stop after you’ve created your sprinkle drip, I believe that when it comes to SprinklePop sprinkles, more is more! Before I dripped the cake, I added a border of Bewitched sprinkles to the bottom edge, and after creating the sprinkle drip I added a buttercream border to the top of this cake using Wilton Tip 6B, then filled in the entire top of the cake with even more sprinkles. So fun! 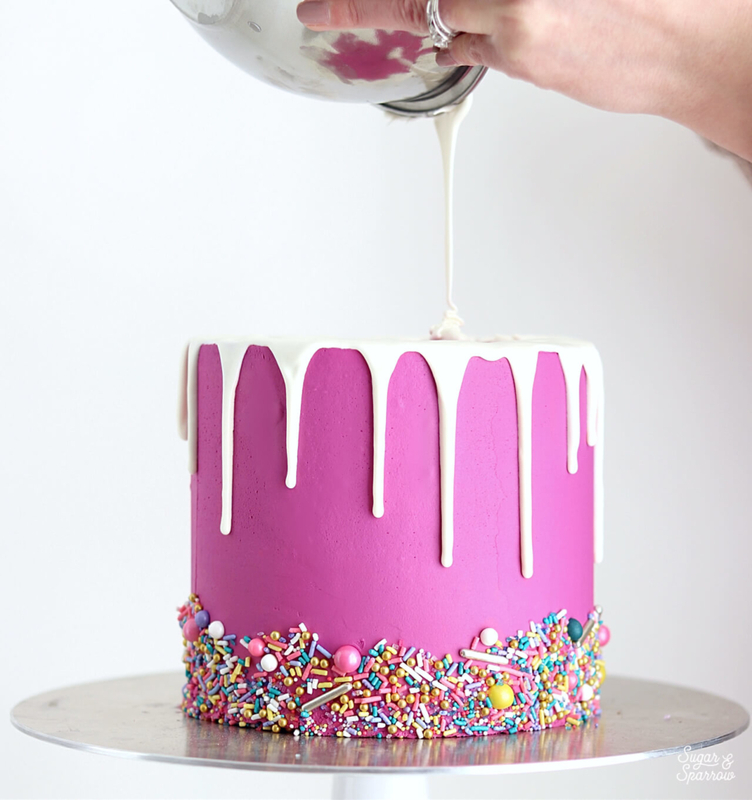 Ready to create your very own sprinkle drip cake? Just grab a bottle of your favorite sprinkles and let the fun begin! Olá Claudia! Muito obrigado! Você é tão gentil. Your cakes are fabulous! I bought these sprinkles to make my daughters cake this past weekend, and I thought putting the sprinkles on the bottom of the cake would be the easiest! I was wrong — I made a huge mess! I know you use tweezers for the sprinkles on the drip, but what about the bottom. I used my fingers, but, yet, I know I must have done it wrong!!!! Thank you so much if you have a moment to help me out! Hi Aimee! Sprinkles are a messy job for sure! 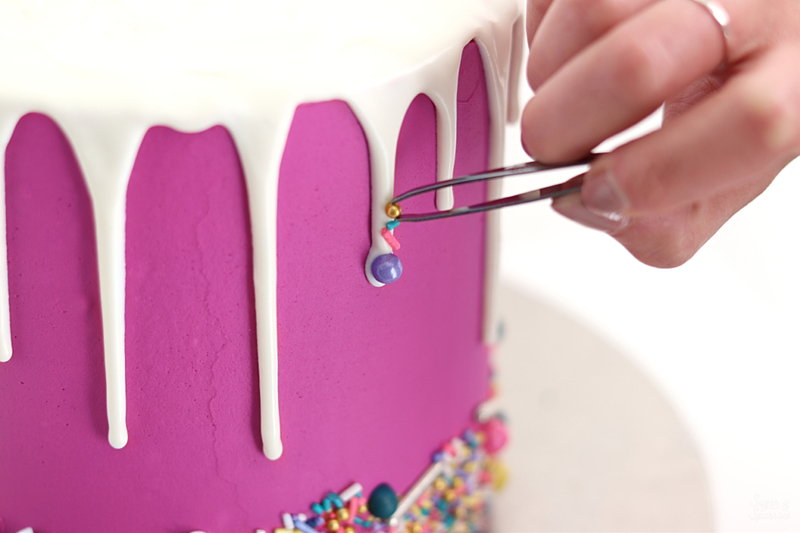 I usually put a baking sheet underneath the cake turntable to collect the extra sprinkles, and for applying them to the bottom border of the cake I use my hands as well. 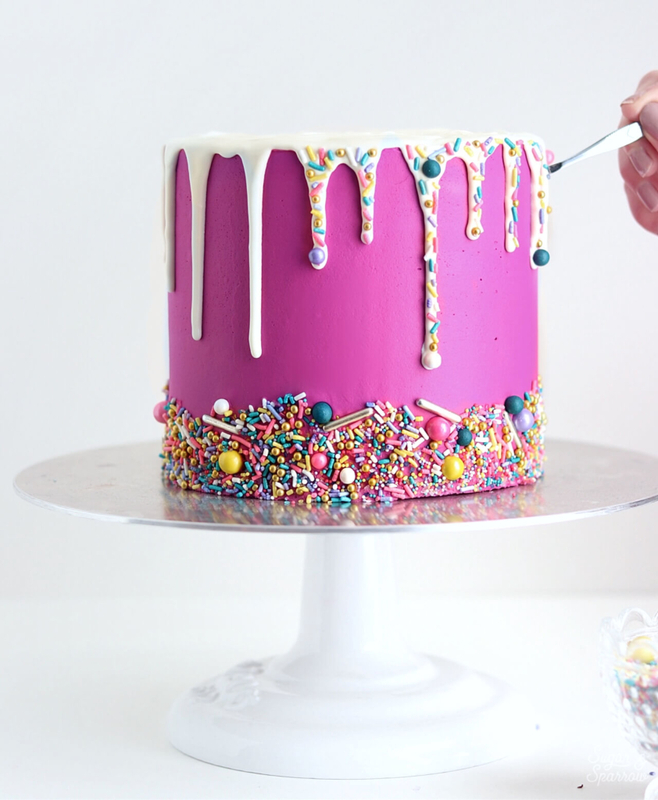 I always make sure that the buttercream is still sticky before I apply sprinkles to it (not chilled or anything) and use the palm of my hand to gently press the sprinkles onto the side of the cake. Omg – could you tell me where to find the butter cream cake recipe?!!!!! Hi Susan! My vanilla buttercream recipe can be found here: http://www.sugarandsparrow.com/vanilla-buttercream-recipe I used Americolor Fuschia to color it. Thank you! I’m having your cake made for my 50th! I’m super excited!! !